As I had promised in my post “Non-Technical Tips for CCIE Lab Troubleshooting”, I am back with a series on troubleshooting different networking technologies centering around CCIE Lab. In this post I will be talking about MPLS VPN. For an average person working in Computer Networks, MPLS seems to be a topic which seems to be most scary. Even if their project involves just an MPLS circuit between 2 locations, the word “MPLS” still scares them although there is not much difference between it and a layer 2 circuit. I have received International calls from many of my friends and colleagues who were overwhelmed by MPLS. This could stem from lack of knowledge on MPLS or the way many people teach MPLS. I have seen many guys teaching MPLS by jumping straight to configuration. 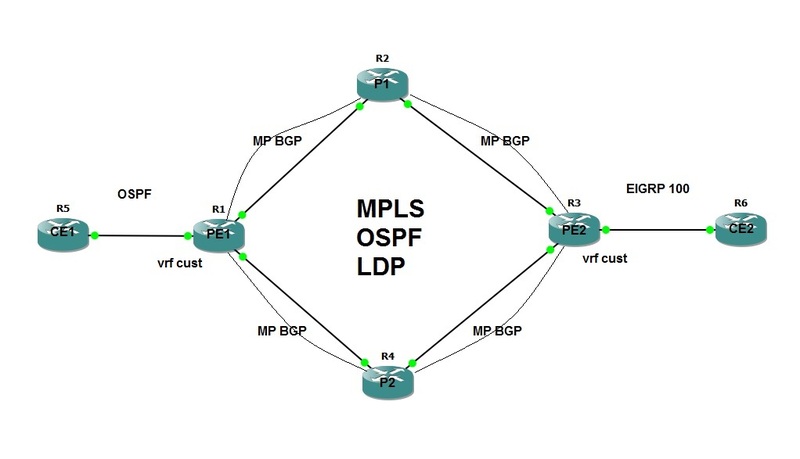 This teaching method even overwhelmed me, so I tore apart MPLS VPN to understand it better and if you see the concept first and then individual protocols, it might not seem that difficult. In this post, I will not explain MPLS VPN but help develop a strategy to troubleshoot MPLS VPN. It is expected that you know MPLS beforehand to make sense of it or at least have partial knowledge. As I had mentioned in my previous blog about the disadvantages of “Show Run”, so I would be concentrating on using debugs and show commands rather than show run for troubleshooting. I have represented the topology using 2 diagrams. First is the logical diagram consisting of the various protocols running and the the other is the ip address diagram. The diagram is pretty self explanatory but I will still explain it. The PE-CE routing protocol between CE1 and PE1 is OSPF. Similarly it is EIGRP between CE2 and PE2. All routers of Provider are running OSPF, LDP and MP BGP. I have not run BGP so as to not complicate the setup and as it is not required and also to show that MPLS does not require IPV4 BGP. There is no requirement for MP BGP peering among all connected provider routers (one mp bgp peering is enough between PE1 and PE2) but it has been done this way for increasing the point of faults. There are changes in the configuration as compared to the diagram so as to inject faults. You should be able to ping CE2 loopback from CE1 loopback. According to me, it is best to use the technique of “Divide and Conquer” to isolate the faults. So we will divide the topology into 3 parts. The first and second will be the easier PE-CE connection of both locations and the third will be the Provider Cloud. We will begin with the most basic command on CE1 and that is to show the routing table. From this output, we know that we are not receiving CE2 routes so the first thing to be checked is local IGP. Since we are running OSPF, let us see we are seeing any neighbors or not. Since we are not even seeing the neighborship, we must go to a more basic level of troubleshooting and that is icmp. There are 2 places we can do ping from, one is from PE1 to CE1 and the other is CE1 to PE1. The better place to do it is PE1 to CE1 but I am doing it just the opposite so as to demonstrate why. So lets ping from CE1 to PE1. The ping seems fine so we assume that the connectivity is fine between CE1 and PE1. Let us do the same thing from PE1 to CE1. We are now able to ping CE1 and also we can see from the log that OSPF neighborship between CE1 and PE1 has come up. There is nothing more we can troubleshoot here so we will move to the second leg of the troubleshooting which is CE2-PE2. Pinging from PE2 to CE2 shows that the connectivity between the 2 is proper. Since we are not getting the routes still, there must be something wrong in the provider cloud. From the routing table, it seems OSPF is learning all routes in the provider cloud. Since this is an MPLS domain, we should see LDP neighborships as OSPF is running fine. From this output, we see that both the provider interfaces are running LDP, yet we are seeing no neighbors. Let us do a debug to see where the problem is. From this debug, we must check 2 things as we are supposed to have two LDP neighbors. The router-id of P1 is reachable and we cannot infer anything else from the debug, so we will move on to PE1-P2 connection. From the debug, we see that there is a “protocol mismatch” message which means PE1 and P2 are running different Label Switching protocol. PE1 is running LDP, let us see what P2 is running. From this output, we see that Fa0/1 is running TDP. Let us change it to LDP and see whether session comes up or not. Still we are not seeing PE1 as LDP neighbor. Option 1: If time is not a constrain, do the debug again and this time on P2. From the debug message, we see a “No route to peer 1.0.0.1” message. This means that PE1’s router-id is 1.0.0.1 and it is not reachable. Option 2 : Since we know LDP is based on connection between router-ids, it would be faster to ping PE1 router-id from P2 to verify. From this output we see that the 1.0.0.1 is not being advertised by OSPF. Let us include it in the OSPF process. From the log, we come to know that now the LDP neighborship on PE1 with P1 and P2 has come up. Our forwarding Table looks good. Let us now proceed to MP BGP. We must troubleshoot the peering further as one of the peering is down and the other although is up yet it is receiving no routes. A show ip bgp vpnv4 all summary on PE1 and PE2 shows no prefixes which means although now the MP BGP is up but still no customer routes are present. *> 10.10.10.0/24 0.0.0.0 0 32768 ? *> 10.10.20.1/32 10.10.10.2 11 32768 ? P1 looks fine but P2 is not receiving any routes. Let us see on PE2 whether we are getting the P1 routes. As we can see from the debug, the routes are being received but are denied due to issue with extended community. As you might be knowing, extended communities are used in MP BGP to import and export Route Targets. Since this router is denying routes with RT as 100:1, it means no router is requesting routes with this RT. 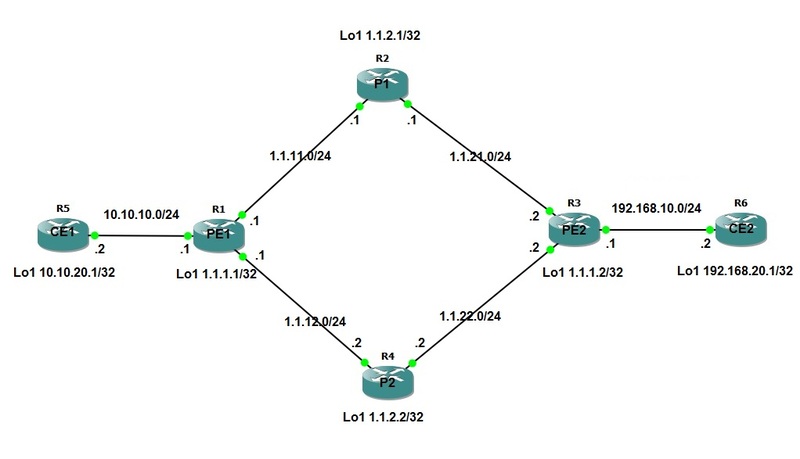 Since CE2 is connecting to PE2, PE2 should request routes for CE2 from the MP BGP. Let us see why PE2 is not requesting routes with RT 100:1. We are now receiving 2 routes from P1 but we must still find out why no routes are obtained from P2. *>i10.10.10.0/24 1.1.1.1 0 100 0 ? *>i10.10.20.1/32 1.1.1.1 11 100 0 ? *> 192.168.10.0 0.0.0.0 0 32768 ? *> 192.168.20.1/32 192.168.10.2 156160 32768 ? Now that we are seeing the routes on PE2, we should also be able to see it on PE1, P1 and P2 and we are. *>i192.168.10.0 1.1.1.2 0 100 0 ? *>i192.168.20.1/32 1.1.1.2 156160 100 0 ? We are not able to get past the MPLS cloud which means there are still some issues in MPLS cloud. Lets start from PE1 and see if we can find the issue. We will start with MP BGP and see if all is well. For CE2 networks to be reachable, 1.1.1.2 should be reachable via MPLS. So let us see its label. The above command shows that there is no LDP Binding for 1.1.1.2/24. Since this interface is a connected interface on PE2, shouldn’t it be having an LDP binding? The problem stems from the confusion between LDP and OSPF. OSPF converts the loopback mask to /32 while advertising while LDP sees it as a /24 connected interface. Due to this, it does not generate any label for this interface. The solution for this is to either make the interface mask as /32 or make the interface as ospf point to point. Let us go with the second. Now let us go back to see if we are getting Labels on P1 or not. Whoa, finally we can reach CE2. There will be always other faults which could be present which I might not have covered. If there is any fault which you encounter which i have not covered, do let me know so that I can include it in the faults. Have a happy troubleshooting. This entry was posted in Everything Cisco and tagged ccie, EIGRP, LDP, mp bgp, mpls, OSPF, Troubleshooting, VPN by samirsogay. Bookmark the permalink.